Looking for even more advice about how to market yourself and your music? Take Ariel’s free online course, Social Media House! A nine-part series, it takes you deep into the world of social media, and shows how YOU can leverage socials to drive your music career. 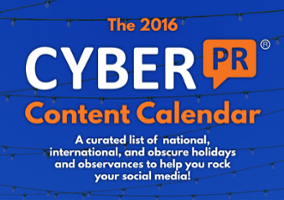 Fill out the form below to get your 2016 CYBER PR CONTENT CALENDAR! A detailed list of national, international, and obscure holidays to help you rock social media posts. Sign up to our bi-weekly Sound Advice newsletter and receive the free bonus "FTP Sessions" video series and 10 mistakes report!